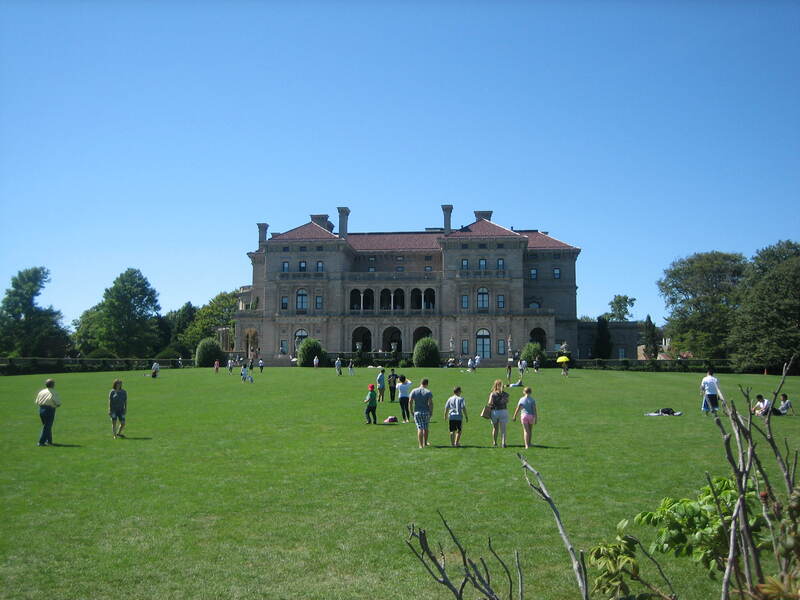 Newport has historically been a summer get-away for the über-wealthy. But you don’t have to be one of Mrs. Astor’s 400 to enjoy a delightful, high-class escape from the rigors of daily life. It’s not the very cheapest place around, but its convenient location and pleasant rooms make this well worth the price. For the best rates, plan your trip plenty ahead, figure on staying mid-week, and when making your reservation, ask when their rates are going to be lowest (To make certain you’re getting the best deal, check the rate posted on kayak before you reserve. Follow the prompts, enter your dates, and then type Newport Harbor Hotel in the “Hotel Name” box on the left ). If you’re willing to drive back and forth from the harbor to your bed (and you have the temperament to fiddle around trying to find parking in Newport), you can use Kayak to book an even cheaper room in nearby Middletown (but remember, parking–if you can find it–will cost $3/hour). and I can retreat to my very nice room anytime I want to put my feet up in a tranquil, private place away from the crowd. Take the Newport Harbor Shuttle (at $10 for a one-hour round trip, it’s the cheapest boat ride in Newport). Board at the Marine Terminal/Perrotti Park (don’t be late, the shuttle stops running entirely at 6:00). Use your map and walk: stroll upper Thames area (between the Common Burial Ground and Memorial Boulevard and between the Harbor and Spring Street); explore the Harbor area while you window shop, look at yachts; and don’t forget to check out lower Thames (on the other side of Memorial) where some of the most unique shops are located. Skip the Brick Marketplace shops–you can see all that stuff in every suburban area of America. Take the Trolley from the Gateway Visitor’s Center. The map/schedule is here. (Fare is $6 for hop on-and-off privileges; ask for an all-day pass when you first board). The visitor’s center can tell you where to get on. Get off at Bellevue and Ruggles, then take the Cliff Walk down to Easton Beach. Take your shoes off and cool your tootsies in the surf. From the beach, it’s a 6-block walk back up Memorial Blvd. to Bellevue (this map gives an overview of all of Newport). Gawk at the mansions. When you’re weary of walking, hop on the trolley going back toward town (wait at the posted “trolley” signs). pop into the historic White Horse Tavern on Marlborough Street and sit at the bar. This is the oldest continuously operating tavern in the United States (since 1673, just imagine). It’s worth seeing. The food is good, too, but to enjoy that treat, you’ll have to come back when you’re not doing Newport on-the-cheap. Meander and explore all evening long, and tomorrow morning. Watch the sunset; window shop; have a cup of coffee, some gelato, a cup of clam chowder; enjoy all the historic architecture; and definitely do a little unobtrusive and enlightening eavesdropping. Armchair Sailor (543 Thames St)–okay, so I’d probably buy a book! Armory Antiques (365 Thames St)–maybe a pair of earrings? Roger King Fine Art (21 Bowen’s Wharf)–definitely cannot afford these oil paintings today, but I do love to look! 11:00 am is CHECK-OUT. Go spend the next 4 hours just up the coast in Bristol. Have a late lunch (avoid the lunch-rush crowds) at Aiden’s Pub–their extensive menu offers plenty of options for budget-dining. You can sit indoors or out. Burn off some calories strolling around the sweetly quieter, lovely town of Bristol. You can squeeze a whole lot of relax-time into 24 on-the-cheap hours in Newport/Bristol. And it’s definitely easier to chill-out, when you’re not stressed out from too much splurging! So–where do you go when you want to relax for 24 hours without breaking the bank? Previous postToo much of a good thing? Has 20 years living with a chef made me the worst kind of restaurant-goer? Wow, lots of good advice! And I never heard of mansion in Bristol – this will be a great place to visit! Thank you! Now I really want to come visit the area! I felt like I was walking along side of you while reading! Yea! I’ll be waiting! We’ll have a grand time! This looks like a great, and well-thought-out itinerary. I love all the detail you put into it. But then, I really do want to write useful itineraries. I figure all I have to offer, really, is my honest experience and opinions. And I have been really frustrated by online and magazine/newspaper “itineraries” that don’t really say anything helpful or new, but are just a repeat of the same few places/activities everyone else is already talking about. I really am trying to share what WE do when we travel, because we enjoy what we see/experience and I imagine a few other, like-minded people, might, too. I hope. Your itinerary sounds great, Tracy! My biggest craving was for some solitude when my children were toddlers–it just NEVER happened that I could be alone and do what I wanted for longer than 5 minutes. And then they grew up. I still can’t believe how fast it went. A nice post, Tracy Lee. I love going to Newport for a day or two as it is only a couple of hours drive away. I’m hoping to meet friends during the time the historic mansions are decorated for Christmas but they are wonderful to visit anytime of the year. The mansions really are amazing–Christmas is my favorite time of year, too. Thanks for stopping by my blog! And I hope you get to enjoy the mansions with your friends during the holiday season. Newport looks like a really fun place to take a vacation. Thanks for the information and tips.